Global demand has driven eight straight quarters of economic growth, Japan’s longest expansion in nearly three decades, and analysts still predict another increase in the first quarter of this year. Yet the production and sales data, the yen’s recent jump and protectionist trade measures from the U.S. offer a reminder that Japan’s economy is vulnerable to shifts in external demand. "For now, I don’t think we need to change our view that Japan’s economy will continue a gradual recovery," said Taro Saito, director of economic research at NLI Research Institute. "The big production drop just doesn’t make sense after we had robust exports in January as they usually go to the same direction." 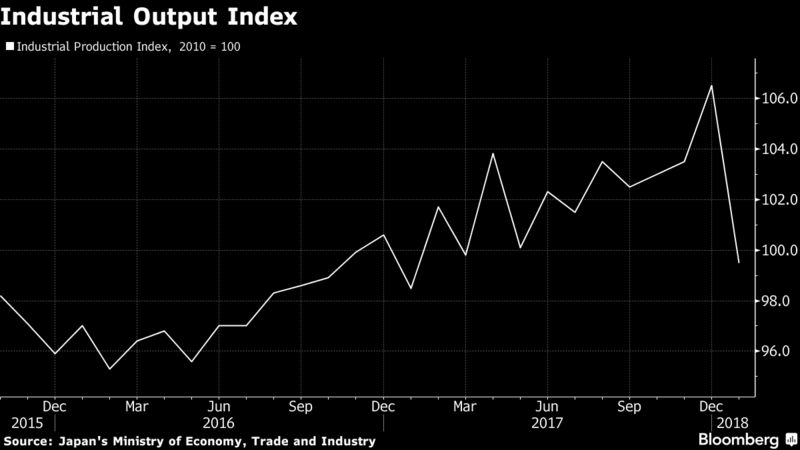 The January output figure also indicates that domestic demand isn’t strengthening enough, said Yasutoshi Nagai, chief economist at Daiwa Securities in Tokyo. "It’s only one month’s worth of data, but when it swings below forecasts this much, you have no choice but to be more cautious," Nagai said. Masaki Kuwahara, senior economist at Nomura Securities, points to the strengthening yen as a risk for corporate profits and investment. "That’s what we’re watching the most," he said. An unexpectedly large decline in January partly reflected a pullback following a steady run-up last year and adjustments ahead of the mid-February Lunar New Year holidays, which tend to damp Asian demand temporarily, Yuki Masujima wrote. A third straight month of reductions in inventories and corporate plans to ramp up February output suggest manufacturers are still on solid ground. Industrial production fell 6.6 percent in January from December (forecast -4.0 percent). Year-on-year output increased 2.7 percent (forecast +5.3 percent). It’s projected to jump 9 percent in February from January but fall 2.7 percent in March. Retail sales fell 1.8 percent in January from December (forecast -0.6 percent). Year-on-year sales gained 1.6 percent (forecast +2.4 percent). Sales at department stores and supermarkets rose 0.5 percent from a year earlier (forecast +0.4 percent).